I'll be giving away $20 store credit to my etsy shop! And many more pretties to spend your store credit on! Here's how to enter. Get ready for a lot of entry options!! None are mandatory, just choose the ones you want. 5. Tell me your favorite item from my shop! Whew. You got all that?? This one's a quickie: Giveaway will be open four days until 11:59PM EST on Tuesday June 14th and winner will be announced shortly after. Have fun, and best of luck!!! i would say my favorite is the sheet metal charm necklace, or the blooming heart bracelet:) so darling!!! 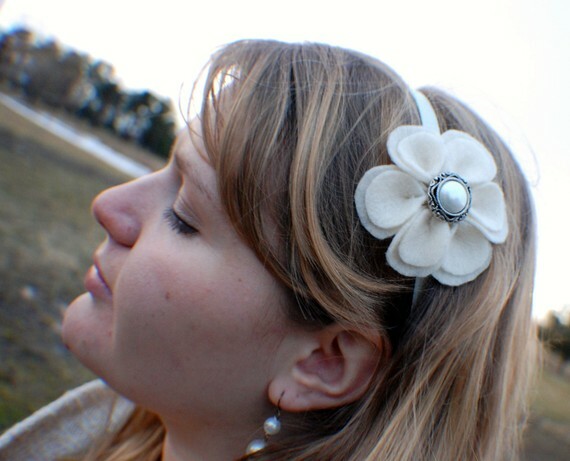 I like White Flower and Pearl Necklace and the flower bracelet in the picture. Now that I know you're on Twitter I follow you. I'm SO winning and buying that new teardrop necklace, LOVE IT!!! I FB'd your post earlier that advertised all of your new jewelry does that count? Love your new stuff! I'm following you on twitter as FabFlawed! I follow you on facebook as Fab Flawed! I already totally heart you on Etsy! I love the Swirl Heart Charm Necklace! 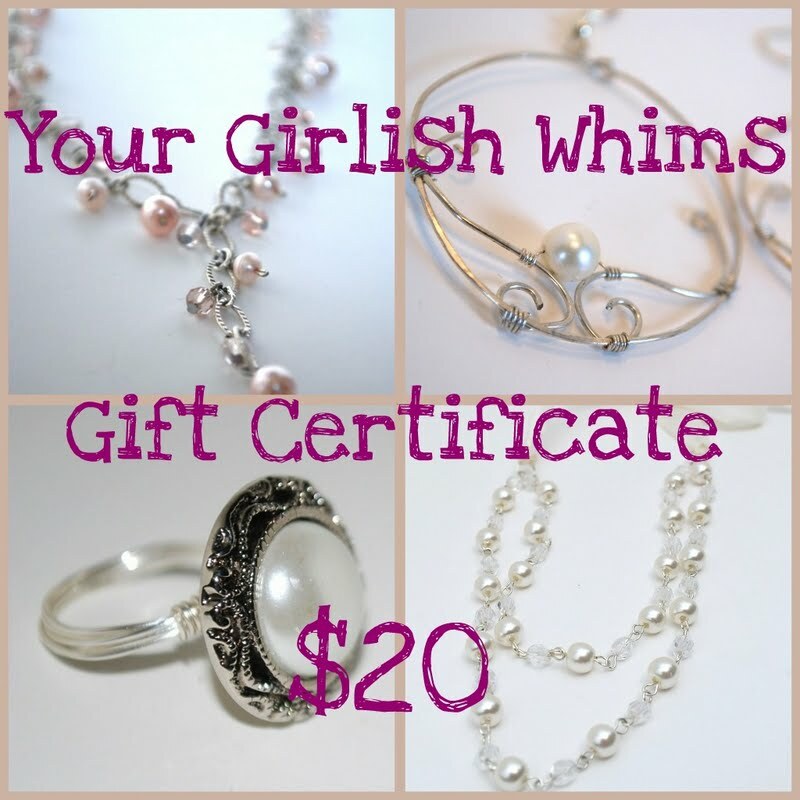 my favorite is either the crystal teardrop necklace or the pearl button ring, can't seem to choose between the two! I like you on F/B and left a comment. I am a loyal follower! *smile* Thanks for the great giveaway! The GFC box won't show up for me to follow you, but I do subscribe to your blog in google reader. The Rebecca necklace is gorgeous and I love the Pearl Button ring... I couldn't choose my favourite! I like the cheetah bow headband in your shop! I'm a follower! I love that blue crystal necklace! So pretty! Love the White ribbons and pearl necklace! As well as many other items! I'm in love with that blue tear drop necklace you just made! I hearted you on etsy! I follow with gfc. I don't know how to choose if I win. Love everthing. I am a sucker for pearls. I think I would get this. I'm a follower. Yeah buddy. I like you on facebooky! <3 you on etsy as looneycrafter. lame i know. My favorite item is the musical necklace, but i own that... So my second favorite is the Catherine! I follow on Twitter (@sarahsmyers). I added your shop to my Etsy favorites! I love all your pieces...one of my favorites is the Gold & Pink Links Wrap Necklace! Your Etsy is in my Faves. I love the new tear drop necklace. i love your crystal tear drop necklace. I heart your shop on Etsy! I love a lot of things in your shop!! The Christa necklace, the three strand light pink bead necklace, the Rebecca necklace, pretty in pink necklace, sparkle gold circle earrings!! Absolutely adore the Blooming Hearts bracelet! Heart your shop on Etsy! I love the headbands in your shop!!! I am addicted! Ooooh, but I LOVE the pearl button ring! What size does it come in??? All of your items are beautiful! I love the light pink beaded necklace...the wire and pearl earings...the ribbon and pearl necklace....the....shall I keep going on? There's something wrong with the follow area on the page...it's missing. Will keep trying though. Not sure if it's me or you. I'm loving the Christa necklace, the pearl ring, and the ruby and gold necklace... I could go on forev-ah! Everything is gorgeous. Already an avid follower of yours! Have already "Heart" your shop on ETSY! I adore the blooming hearts bracelet! I like you on Facebook! Yay! Yay! I follow you on good ole Twitter! Yay! Yay! Yay! Really? We have to choose just one thing?! Well I do love the Flower Cabochon rings!! I'm a follower. thanks for the chance to win. I like your delicate wire and pearl earrings. 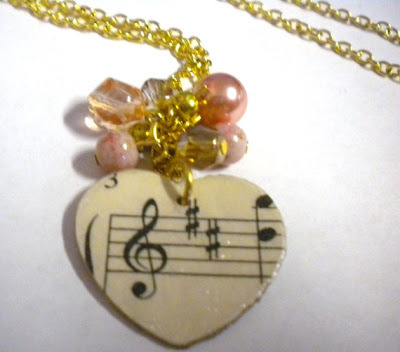 It was so hard to choose my favorite thing from your shop, but I LOVE the Sheet Music Charm Necklace! I love everything in your shop. I REALLY love the Gray Crystal Frame Earrings. AND the silver bead cocktail ring!!!! And I love your "white ribbons and pearls" necklace! I love the sheet music charm necklace! I heart you currently on Etsy! I have written tomorrow's post about your giveaway!! I'm a blog follower via GFC. Thanks for the giveaway! I can't choose one thing. There are so many that I really like. However, the Catherine necklace really caught my eye. I now like you on facebook!! I most certainly heart your etsy shop .. I just LOVE your sheet music charm necklace & the pearl button ring...!! beautiful!! I just found your blog and your shop on Etsy this week & I love it! I think my favorite thing is the sheet music necklace. I can't wait to show my daughter because I think she will love it even more. I also "liked" you on Facebook so I'll remember to check & see what's new all along as well. My favorite is the white ribbon and pearls necklace.. simply fabulous and rich looking!! I follow your blog via GFC..